We drove about 15 minutes to get take out for dinner tonight. So often when we do this, I don’t think to grab Adrian’s Dynavox on the way out. I’m always sorry I didn’t. If we’re getting anything but pizza, he’s very disappointed. Well, that’s putting it nicely. He’s angry and usually throws a tantrum in the car on the way home. But tonight I remembered. When he realized we weren’t getting pizza he started yelling. I handed him his device and asked him to ‘tell me’. He went into the screen of food choices and scanned the options. I was surprised he didn’t ask for pizza. My guess is he knew that would be a hopeless cause since we were already driving toward home. Instead he said, “I want to eat waffles” and looked at me with a questioning look. I told him, “No, I’m sorry. I don’t have any waffles. What else would you like?” Next he asked for fish sticks. I told him I wasn’t sure if we had any, but we could check when we got home. At this point in the trip, if I had forgotten to bring the device, Adrian would have been in full meltdown mode. He would have been yelling, pinching himself and others, possibly hitting people or the interior of the car… not a pretty picture. But instead, although he was clearly still not thrilled about the circumstances, he was pretty calm. Thinking about what I had at home he might like for dinner, I suggested eggs and toast. He smiled and made the signs for these foods. We’d reached a good compromise and he was now laughing and smiling. For the rest of the trip we continued to ‘chat’. We talked about how he was hungry. We chatted about the color of Dad’s shirt. Zee got involved and asked Adrian what color shirt he had, then helped Adrian answer on his device. Adrian thought this was funny. This is one of the more obvious circumstances where the Dynavox V can make all the difference. Having the ability to communicate, even if he doesn’t get exactly what he wants, makes everything easier to deal with. I just need to remember to grab it on the way out the door! Maybe I’ll hang a picture of it on the door so I don’t forget to grab it on those little trips…..
I’ve been very quiet here. I’ve had a lot on my mind lately as far as Adrian is concerned. We’re a few weeks into school now. The teacher and the classroom aide I’ve gotten to know are nice. Adrian hasn’t given me much trouble about going in to school. So I guess you could say things are going well. Except I’ve had this uneasy feeling about his classroom assignment. I was disappointed and even a little concerned to see that none of the children Adrian spent the last two years developing a relationship with are in his class this year. His classmates are very different from last year’s group. Only one of the 8 other children in the room is verbal. That makes it much harder for him to connect with them. I don’t really know anything about his classmates. I’ve only just observed a few minutes here and there while picking up and dropping off. I guess that’s why I’ve hesitated to say anything to the school staff about how I was feeling. It amounts to little more than a gut feeling, formed without the benefit of the facts. I was grateful this morning when the social worker made a request that I attend a team meeting next week. I’m anxious to find out more about how these new teachers and therapists see Adrian, how he’s relating to his classmates and how his classmates are relating to him. I told the social worker of my concerns and I feel better knowing that by this time next week they’ll be addressed and hopefully, put to rest. Adrian just finished his first week of school. 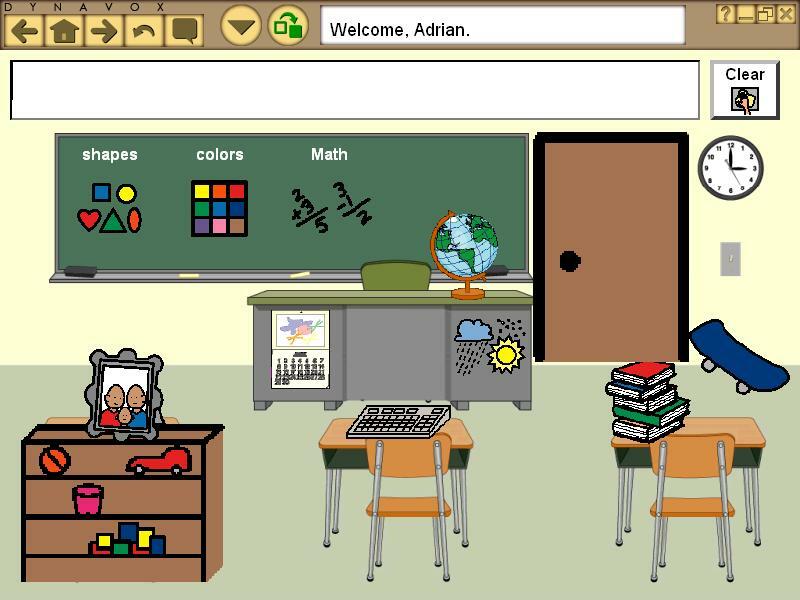 The new team of teachers, aides and therapists have already given me some new things to add to his Dynavox V. In order to accomodate their requests and improve Adrian’s ability to locate all the school vocabulary, I designed a new school page. Using a visual scene, I was able to fit a lot of different options into this one page. In this scene you can click on…. The shapes, colors or math on the blackboard to reach those pages/popups. I’m sure we’ll be adding more as the school year goes on, but hopefully everything will fit nicely into one of the sections already established here. Without a doubt, I’d say Adrian enjoyed this vacation more than past trips…. and that’s saying a lot considering how much he loved the other trips. The laminated communication card provided him with an easy way to make his desires known. I’m still kicking myself for not having done this one on previous trips. Adrian regularly went into the bag to retrieve his card to tell us what he wanted to do next. He told us what rides he wanted to go on and even told us he wanted to go back to the cabin for a break. Even if we couldn’t immediately grant his request, just knowing we understood significatly reduced his frustration level. We took it easy on the restaurants. Adrian isn’t a big fan of restaurants. His picky eating makes it nearly impossible to find him something to eat. The wrong brand of hotdog, the wrong color cheese or even the wrong fryer oil and he won’t touch his usual favorites. Problem is, the food (or lack of preparing it myself) is one of the things I look forward to most on vacation. The cabin has a full kitchen but that doesn’t mean I want to use it! So before we left I researched take-out restaurants in the area. We picked up menus and ordered in. It was great. We were able to fix Adrian his meals and enjoy our food in the comfort of our cabin. The couple of restaurants we did go to, Adrian used his headphones and was pretty calm. It was a good compromise. We took breaks. With the heat, Adrian needed regular breaks to chill out in the cabin. In the past I think we pushed our limits in our attempt to please the other kids. This time, rather than go at it straight for a few days and then take a day off we went to the parks everyday but always took atleast a few hours break in the middle of the day. We got to all the rides and I think it was less stressful on everyone. I’m definetly adding these things to my ‘must do’ list for our next Disney trip. We’re back from Disney World and I have to say it was the best vacation EVER! Adrian had a great time. His favorite ride was Soarin’, a ride that makes you feel as though you’re on a glider as fly through California. A close second would be Mickey’s Philhamagic, a 3D movie that has all Adrian’s favorite music numbers from the movies. We also spent time all all his other favorites : Pooh, Peter Pan, the TTA and Small World.